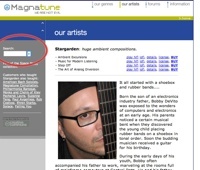 Magnatune is now offering a "free song of the day." This is a no-cost single 128k mp3, without any talking on the end, that you can download for free. The idea is to promote a new song every day, and have people come regularly to the site to get the free song. 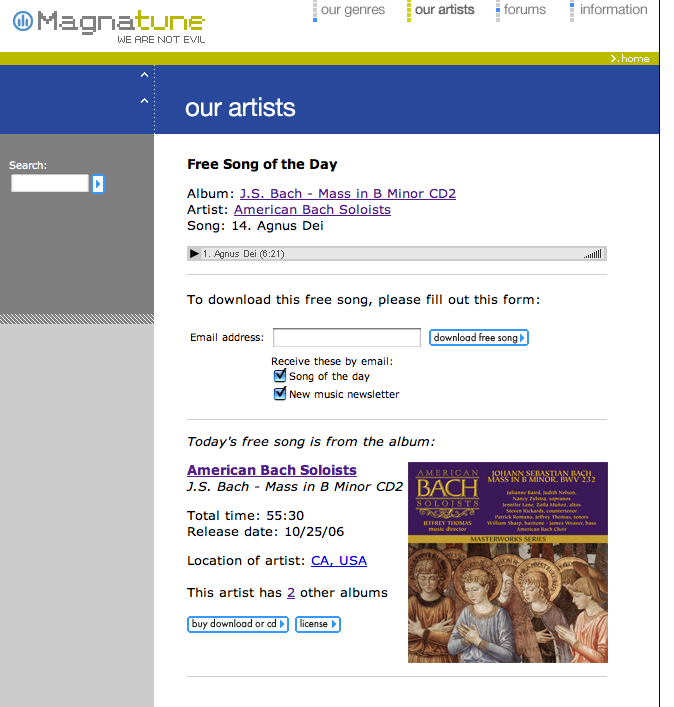 The new feature is promoted on the home page, and there's a dedicated "free song of the day" page at http://magnatune.com/today/ The picture on the right shows what this page looks like. There's a form to fill out to get your download, to try to motivate people to subscribe to our once-a-month music news email, or the daily free-song-of-the-day email. You don't have to provide your email address, you can simply click the "download free song" button and a zip file of the mp3 will be given to you, but the nudge is there to encourage people to sign up. The download is a zip file, so that the free song downloads well w/o having to hit "save as" in your web browser, which you usually need to do with mp3s. The goals behind this new feature are to get more signups for our announcement list (since our announcement list size directly leads to sales), as well to get people to come to the magnatune web site more often. One of the interesting things about our music news email is that we see a 3x spike in sales for several days after the email goes out. This fact makes me believe that people are interested in buying from Magnatune, but they simply don't think about going to the site regularly. Hence, the idea behind a song of the day announcement email, which is a daily email letting you listen to the song in your email client, and download it with a single click (no form to fill out) once you're on the daily announcement list. The email announcement for the "song of the day" is formatted a bit differently (see picture at left). Among other changes, it includes an artist photograph. There's also a failsafe, super-easy unsubscribe email address at the bottom of every message. If you read the email the day after the song-of-the-day was sent, you can still listen to the song in the email, but the "download free song" button will take you today's free song, not the previous one. 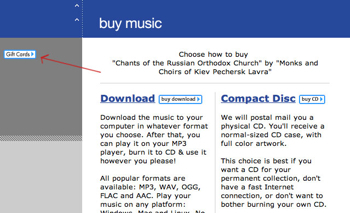 That might be a bit confusing, which is why there's a "only available today, sunday" message below the download button. The itunes-like music browser feature at Magnatune (click "browser" from the home page) now uses a builti-in flash music player. The upside to this change is that playing music is now completely contained in the window, much cleaner looking, and it's really quick to bounce between albums because I've found that very few people know about the smaller, more compact variants of the music browser. I also added links to the "smaller/smallest" versions of the browser on all the variations of the music browser. 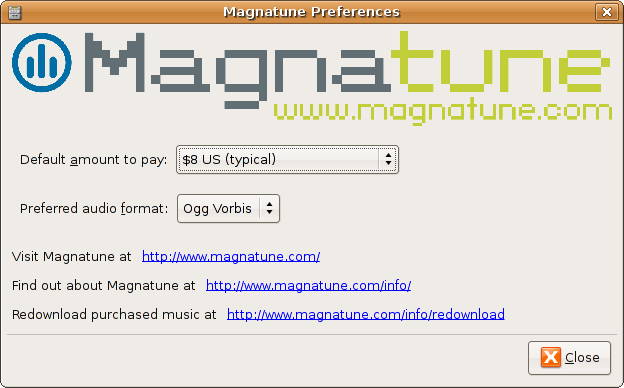 My plan is for this music browser to be one of the main ways subscription-paying users of Magnatune will play music. 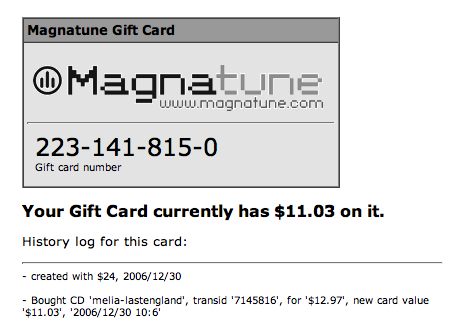 It's compact, and feels like itunes, yet has all of Magnatune's music in it. And, when the subscription feature is available, it will be commercial free for this users, as well as using Flash's excellent internet-buffering, which is much better than mp3 streaming for avoiding Internet-bandwidth-caused stuttering. Of course, the music browser will continue to be available for free, with the commercial ("you just heard...") at the end of each song. The downside to this change is that few flash-enabled mobile phones exist, so phones using these interfaces won't be able to listen to music. That's not a big loss, because I don't know of any mobile phones that worked with Magnatune previous to this change. While I thought .m3u files and thus mp3 streams, would work in mp3 enabled cell phones, the phones I've tested with (such as the Nokia N80) almost worked, but gave errors when they tried to play the m3u file. I'm guessing that adding Flash support to mobile phones that have Internet access (And web browser) is a high priority for the phone makers, since so many sites use flash, so when they add that support, mobile phones will work with the Magnatune music browser. 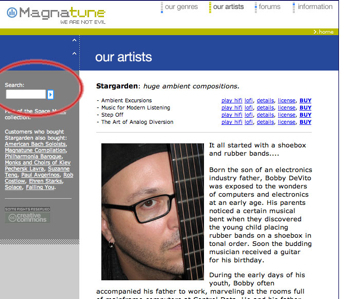 I've added a search field on every page at Magnatune. The search program I wrote checks (in order) artist names, albums, song names, collection types, artist bio text and pages in the /info section. The results are grouped and ordered by these criteria. 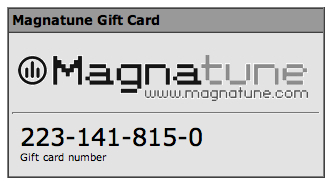 Just in time for New Year's, we now have Magnatune Gift Cards! A Gift Card is a pre-paid card that you can use at Magnatune instead of a credit card number. You can give a Gift Card to a friend for them to spend as they want. You can also print out the gift card, which is credit-card sized, and give it physically to them. You can buy yourself a Gift Card, so that you can group separate purchases into one charge on your credit card. Several companies have wanted to give away a "$20 gift certificate" at their conferences, as an incentive for people to come to the conference. We now offer this, and can either give you a list of gift card numbers, or physical, pre-printed cards that you can give away. Instead of paying for the value of the cards given away, you are only charged for the actual usage of the cards. Since most people will never get around to using the gift card you give them, the actual cost to the company is much lower. If you run a charity that has gifts for certain donation sizes, or if you auction off donated goods to raise money, talk to us. We can provide you (at no cost to you) with gift cards that will provide an incentive to people to give to your charity. If you want to provide your customers with some legal music. For example, if you sell an MP3 player, you could include a gift card in your packaging, so that new users of your device can get started for free. 2) contacting us to make any number of gift cards for you at whatever amount you desire, either paid-ahead-of-time, or we-bill-you-for-usage. We can provide you with pre-printed labels that you can affix to your materials, an excel spreadsheet of the numbers, or pre-printed cards. If we are billing you for the actual usage, you will get an excel spreadsheet from us showing every card you were given, which were used, for how much, and exactly which albums were purchased by which people. 1) When buying a CD or Download, click the "Gift Card" link underneath the credit card field, then buy as you normally would, entering the gift card number where directed. 1) Gift card status: at the gift cards menu (which you reach from any "buy" page) you can find out the status of your gift card, including how much money is left on the card, as well as a log of all activity on the card. 2) Add to your gift card. Also available from the gift card menu, you can "top up" your gift card to any amount. 3) Lost your gift card? if you gave us your email address on a previous gift card purchase, you can now retrieve your gift card by providing us that email address. Your gift card numbers are then emailed to you. Shannon has been writing mini album reviews & notes for most of our new releases since she came on board at Magnatune. 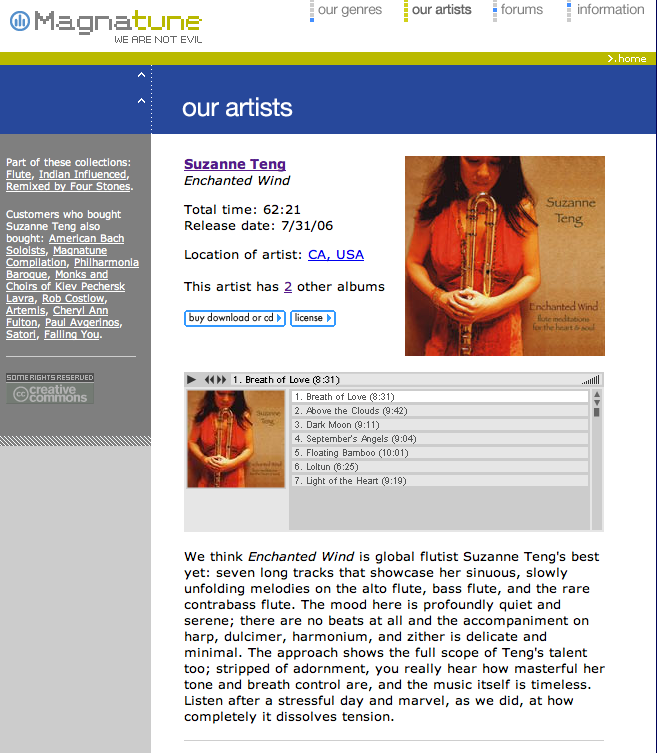 These reviews & notes are now displayed on each album page where we have them, right below the Flash mp3 player. It's time for a summary view of statistics of how Magnatune is doing. I try to do one of these at the end of each year. This first chart shows consumer sales of music (downloads and CDs) in dollars (sorry, dollar amounts aren't something I'm sharing yet). You can see that in 2003/2004 we were on a downward trend, which was more or less stabilized in 2005, and then in November 2005, went up about 80% and have held there. I believe this increase was caused by a bunch of changes we made, such as the "share with 3 friends", "podcasting license" and "shannon's voice at the end of each song"
It's great that we increased sales and stabilized them, but I'm puzzled as to why our consumer sales didn't increase at all in 2006. We're going to need to work on that. 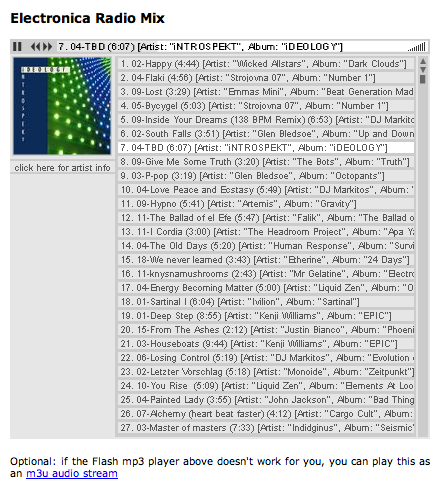 There are a ton of new things that should effect 2007 sales, such as the flash player, roll out of subscription and fill-your-ipod offerings, free-song-of-the-day, and others. The number of music licenses we're selling every month grew dramatically this year, at 2.5x pre-2006 levels. 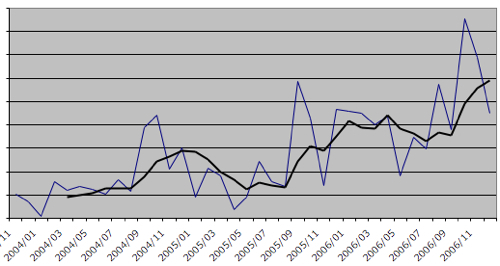 Naturally, with that much of an increase in licenses each month, we see that licensing revenue also increased. However, revenue increased by a much smaller amount than quantity, which indicates that we're selling many more less expensive licenses. 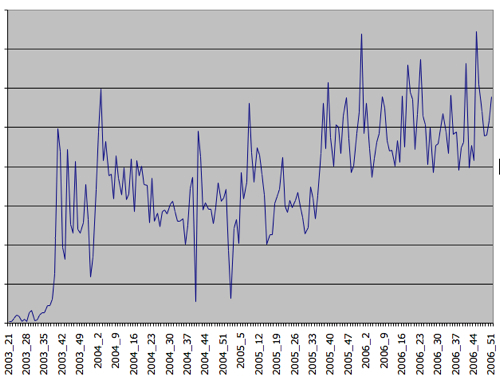 More quantity is good, as we're less beholden to a few clients or sales each month, but overall the trend is worrying. However, if we can make up the lower per-license-price with increased quantity, we'll be ok.
And now onto web traffic stats. 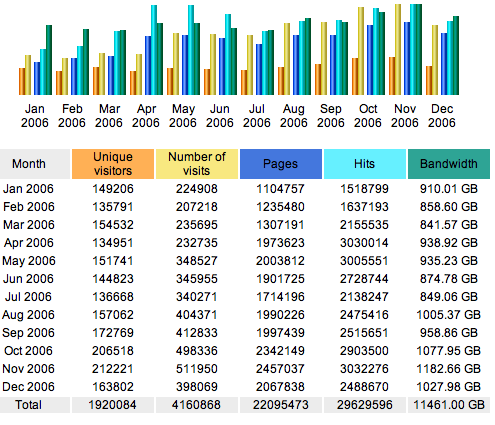 The metric I look at most is "unique visitors" which grew 50% this year, from around 13,000 per month to around 20,000 per month. That's good news, and I believe this is mostly coming from podcast listeners. Since consumer sales didn't increase this year, I think this means we're doing a poor job of converting podcast listeners into paying customers, and that's something I aim to work on this year, specifically with the subscription service. You can also see that the number of visits grew 2.5x times, even stronger than the # of visitors, as did the number of pages viewed. Overall, this shows that a lot more people are coming to Magnatune, and staying longer. 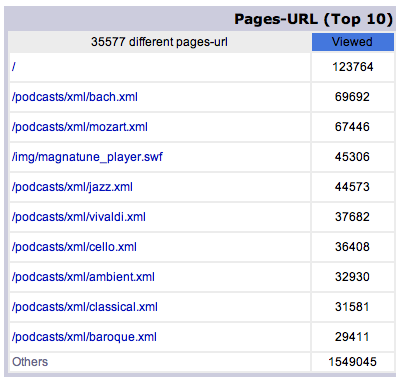 this stat mostly shows that our podcasts are the most popular single pages at Magnatune, and they're extremely popular. Classical podcasts dominate the list, but Jazz and Ambient also make it into the top 10. An hourly breakdown of our visits shows us to be most popular from 9am to 2pm pacific time, but there is a strong spike at 6am pacific time (which is 9am eastern time) and of course, 2pm pacific time is 5pm eastern time. So, we're most popular during office hours. However, even at 2am we've got a lot of visitors, which indicates a very international audience. Part of the smoothing is undoubtedly due to podcast downloader programs checking at random times, but I don't think that accounts for much of it, because that would be evenly distributed throughout the day. Magnatune runs on a 100mbit feed and alternates daily between 25% usage on the low side, and 80% usage on the high side. The chart above shows 7 week's worth of data. The 80% max usage is where I expressly set it, by increasing/decreasing the number of allowed listeners on the shoutcast statsions. We could easily use another 100mbit line with more shoutcast listeners, but I haven't yet figured out how to convert those people effectively into paying customers, which is why I have not increased our bandwidth. 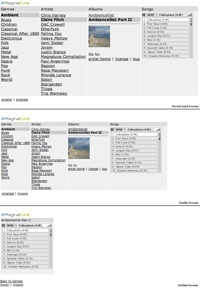 The Genre Mixes at Magnatune, which you can reach by clicking any of the genres on the home page, or by going to the Genres tab, now all use a very-tall version of the flash player. I made the player a lot taller than on the album pages, so you can really see what's coming. I also put the artist & album name in parentheses after each song name. It makes it a look a bit crowded, but I think it's important information. I limited each genre mix playlist to 500 albums (about 2000 minutes, or 33 hours) so that it starts playing quickly. With the entire classical playlist formerly weighing in at 3500 songs, it took about 30 seconds to start playing, and with 500 songs the pause is under 5 seconds. Also, for people who have Flash disabled in their browser, there is an "m3u stream" link below the player, which goes to the old m3u (ie mp3) streams. I've made sure that everywhere the flash player appears, there is a backward compatibility link to the m3u streams. Also, at Shannon's suggestion I changed the "album details" pages, such as the page you get by clicking the album art on the home page, to auto play when the page comes up. It definitely makes it easier to use (no wondering what to click to start playing) but I was worried we'd get complaints. But, myspace works that way, so people must be at least used to it, and so far, we've gotten no complaints, and sales have been quite a bit stronger since the flash player went up, so I think her opinion was right. In August 2006, I was invited by Joi Ito to speak at his "New Context" conference in Tokyo. The video above, from the KNN News Network, is a 7 minute segment mixing my public speech with an interview I did with the super-happy media personality Toshi Kanda and was produced by his company. 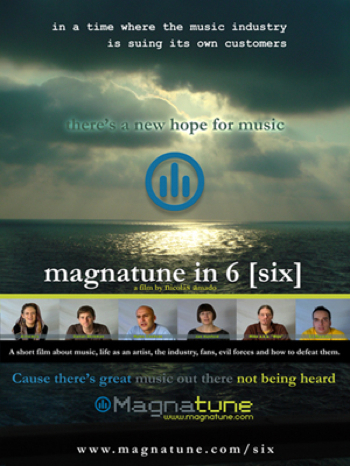 The film "Magnatune in 6 [six]" is now available for viewing. You can find it at http://magnatune.com/six, and if you have a fast internet connection, there's also a very-high-quality version. I did the interviews of the musicians myself in London, but everything else was done by Nicolás Amado, who did an *amazing* job. I was very flattered when he flew up from Spain to meet me in London, and even more flattered that he made such an amazing film. And as a surprise gift, Nicolas made the super-cool poster pictured above. A big giant magna-thanks to Nicolas! 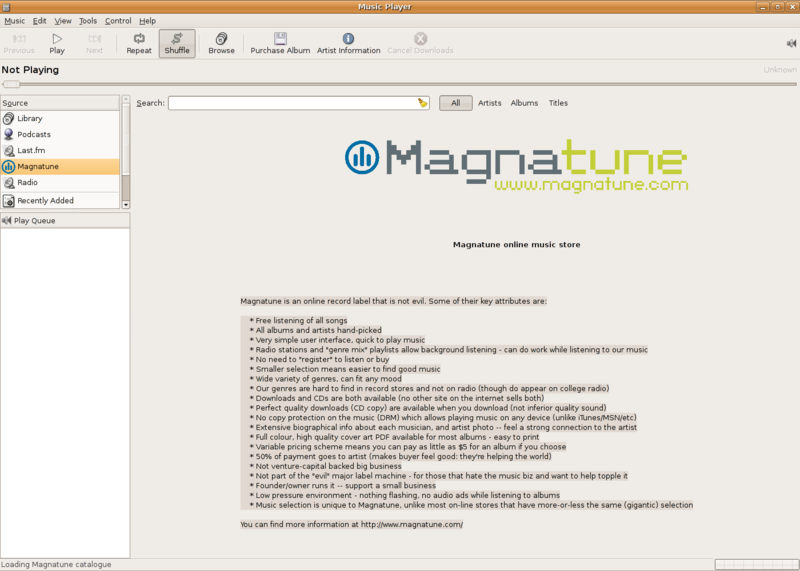 Rhythmbox, a popular music player for Linux's GNOME desktop, has added support for Magnatune. then run your graphical package manager, update your repository list, and Rhythmbox 0.97 should appear as a choice. 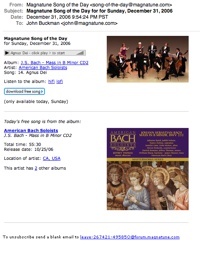 The first of these is a new plugin which provides integration with the MagnaTune online music store. 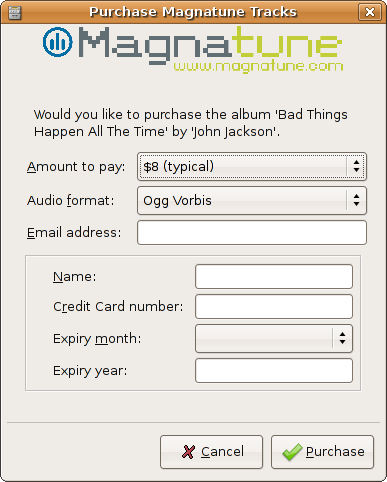 MagnaTune lets you listen to entire tracks before purchasing them, provides a variety of DRM-free formats including Ogg Vorbis and FLAC, lets you choose how much you are willing to pay for an album, and has a "don't be evil" policy. This is the first version to include the Magnatune plugin. So to all Rhythmbox users: download, enjoy, and give feedback. Could the UI be better? Any features you'd like to see? Bugs that need to be squished? Adam sent me several screen pictures, which I've included in this blog posting.